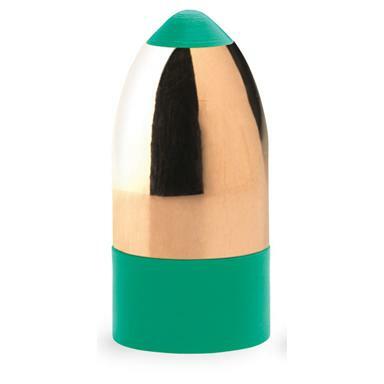 CVA® PowerbeltTM .Aero-Tip Copper Series Black Powder Bullets... power-packed ammo! Muzzleloading projectiles you can count on! Made by CVA®, the leader in black powder shooting accessories, so you KNOW you're getting the best stuff. Developed to give the muzzleloading specialist all the benefits of sabots without the constant cleaning after every shot. And with a perfect gas seal, you get harder impact... and that means every shot that finds your target will do devastating damage. Order your ammo right here at The Guide today! CVA Powerbelt, .50 caliber, Aero-Tip Copper Series Black Powder Bullets, 295 Grain, 15 Pack is rated 4.6 out of 5 by 19. Rated 5 out of 5 by bearfoot from Works, Good Accuracy Had some of the lighter ones of same bullet and they tumbled because they were so light. Switched to the Powerbuilt 295 gr, Shot and elk a few weeks ago, complete pass thru, at 110 yards, elk ran 100 yards, stopped, fell down dead. Very nice results. Just ordered another 30, my go to bullet. Rated 5 out of 5 by Tobor from Great price and accuracy! I usually use the standard hollowpoint power belts with good results. I tried these at 100 yards with 80 grain of Triple 7 powder in my CVA Optima V2. I had 1 group all holes touching and another with 2 holes touching and one 1.5" from that. I also used them with same powder in my sons new 50 cal Optima V2. I also had 3 holes touching. They shot as well as the 300 grain aerolites. Not sure if it would shoot as well as aerolites at 150 yards though. Photo shows 3 shot group after final scope adjustment at top of diamond bulls-eye all touching. Rated 5 out of 5 by Mike F from Best Price! The best price I have found on these. My inline really likes them rewarding me with tight groups at the range and good knock down power. Love Powerbelts. Fast shipping from SG as always. Rated 5 out of 5 by HeavyC from accurate ammo These powerbelts are very reliable and accurate out of my CVA. Rated 1 out of 5 by James from Not as good as they use to be I have used these since they first came out, back then they were awesome on deer. This past season me and my hunting buddy both shot deer at 50 yards broadside, his shot and mine were in the breadbasket. The deer walked off like they got hit with a BB, very little blood trail and if not for watching the deer going Up the ridge we would have never found his 6pt about 150 yards away. Mine run 60 yards and bedded down below me and I had to reload an shoot again. His an mine were not clean pass through shots even at 50 yards, shooting 100 grain triple seven pellets and 295 grain aerotip powerbelts. They do shoot very accurate, but I think the core has been softened too much. We both found our projectiles in tact about the size of a nickel flattened out about 3/16'' thick. When powerbelts first came out the deer would have had a wound channel that you could put your fist through with the same 50 yard broadside shot. Switching to Hornady's 300 grain FTB solid bullets to get that rifle effect on deer again !